A pallet is a flat transport structure which supports goods in a stable fashion while allowing easy handling and storage efficiency. Loads with pallets under them can be hauled by forklift trucks or by hand-pumped and hand-drawn pallet jacks. This review covers Transpallet (510), a set offered under Royal Model label delivering 1/35 scale pallets and pallet jack, a very welcomed addition to many modern day dioramas. The kit is packed in a typical Royal Model fashion: a vacuum-sealed hard cardboard with a box art featuring an image of assembled and painted set. Opening the box reveals a bag securing resin pieces, additionally protected using bubble wrap, and a simple instruction sheet. The resin pieces look good. I found some flash casting residue on the pallet jack lifting forks which had to be cleaned using a sharp X-acto blade. The details on the pieces are nicely rendered… I particularly like the slight wood grain structure visible under magnification. This kind of texture should pop right out when painted and weathered. This set includes a high number of parts and patience is needed when removing the pieces from their carrier blocks. Each pallet consists of 13 pieces and cleaning all those is a long process. Upon finishing the cleanup, I noticed some wooden planks were slightly warped. Returning the piece to its original shape is usually done using hot water, but this is a process for which I suggest some practice on scrap pieces of resin first. Instruction sheet is included in this set and I would suggest taking the time to study the assembly guide before starting the build. The sheet denotes the pieces in the set and shows the assembly steps. My set had a bit different part setup as 10 pieces depicting wooden planks required for building each pallet were cast together on a single casting block. Not much of a change from an original setup, but still worth noting. Also, my set included an extra block with wooden planks which is an added bonus. I assembled the jack and a pallet for this review. It is a pretty much straightforward process, but some care is needed to get everything straight, obtaining the optimal geometry of both the pallet and the jack. I started by fixing the three planks to the palette bottom, making sure these are parallel to one another. The top of the pallet features 7 wooden planks which need to be aligned well and evenly spaced. I fixed three planks first: one to the center and one on each edge, copying what I did on the pallet bottom, again making sure these pieces were parallel to one another. I added the two planks on each side, trying to get even space between all the planks. Pallet jack is a delicate thing and the assembly does not tolerate manhandling the pieces. Finally, I have to say the process is not as hard as it may seem at first and the extra effort is well worth it in the end as the finished product looks very realistic. Transpallet (510) from Royal Model is a really nice set. 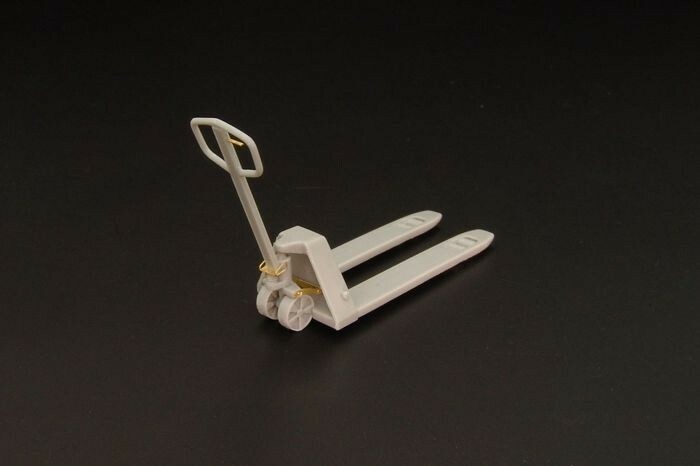 It includes resin pieces for building two pallets and pallet jack in 1/35 scale. The resin cast is good and the assembly not too complex for an average modeler. The finished piece looks very realistic and should prove a great addition to many vignettes and dioramas. Highs: Nicely cast in resin. Extra planks are a bonus. Painted and weathered this set could turn into a focal point of many dioramas. Good idea but several mistakes. Under each fork there are 2 little wheels, 1 is missing. I don't know if it is an italian conception, but a normal transpalet must have the big wheel aligned with the arm, not offset. And the handle is missing. I agree with Alex about the rear dual wheels setup (and the missing front wheels and control handle as well). A 1:1 one with such a setup would not last very long.... The Plus Model one or the J's Work ones and also the Hauler one : look to be more accurate.... H.P. I agree with the big wheels and the release lever. But one roller under each fork is possible. https://commons.wikimedia.org/wiki/Category:Pallet_jacks?uselang=de In my company, we use a Hubwagen that has two small rollers left and right of the lever. These rollers are moving freely, which mean the can maneuver beteer in tight confinements. I agree on the single folk wheel. The other issue with the rear wheel, how does it turn, with brackets on the outside of the wheel? I think you could rotate the wheels from behind to underneath and then rebuild the trapezoid frame work to have the forks sit level. Since it's not carrying weight, I would separate the wheels and add a post in the middle so you could turn the jack. Then cause I don't understand how does the jack raise on a spring action and not a hydraulic jack? You could fashion a hydraulic jack and add the lever. At least that's what I think I would do with my pallet jack. I think Frenchy's options are better for a more realist pallet jack. The Plus model looks to be for European pallets and J Model for American pallets from what I can see with the fork spacing but I could be and probably am wrong with that. Hi Ryan. Usually the front has 2 wheels aligned under the front handle that are aligned to the pull handle. They turn as you pull or push on the handle in the direction you want to go. They do not move separately or independly.The release handle is normally on the right side in the yoke that you pull. The back (wheels) are a cylinder shape which stay down as you pump it up to move. Normal pallet jacks, the rear wheels do not maneuver, only rotate forward and backwards. Basicly like the wheels on a traier.Hope this helps answer your questions about this.Note key word is usually. I'm sure there are exceptions I have never seen or used.